Fun Fact. Since he is a Canadian hero, he actually uses 2 code names at same time, in English (Guardian) and in French (Le Gardien). Introduced in X-Men #109 (1978) by Chris Claremont and John Byrne, James Macdonald Hudson, nicknamed Mac, had develop his suit to help search for underground oil deposits for Am-Can Oil Corporation but quit when he found out that they wanted to use the suit as a weapon. Joined by his future wife, Heather, they sought help from the government and helped run Canada’s department for superhuman activities, Department H. It was during this time that the couple encountered a feral Logan, who had just escaped the Weapon X facility. They helped him return to normal life. His encounter with Wolverine and hearing about the American super teams like the Fantastic Four, Mac helped set up a new Alpha Flight program. He want Logan to lead the team but Logan’s guilty attraction to Heather caused him to instantly accept Prof X offer to join the X-men. This infuriated Mac, who redesign his suit and took the name Weapon Alpha and tried to bring Wolverine back to Department H by force but was defeated by the X-men. He then gather other Canadian heroes and formed the Alpha Flight and battled the X-men. Mac and Wolverine eventually made peace and now consider themselves family (which is even more true when you learn they are first cousins). A battle with Omega Flight lead to his first believed death but instead he was thrown into a spatial rift. He was found by an alien race and turned into a cyborg. He was sent back to Earth but found by Roxxon Oil. He was rescued by the future Box. Alpha Flight eventually helped the alien race that saved Mac to stop Galactus but Mac was again believed killed when he sacrificed himself. He was eventually found by the Master of the World and brainwash into Antiguard but this saw his body return to normal. He was killed again and replaced by a clone but eventually returned home. He reunited with Heather and eventually had a daughter. Most of Alpha Flight was killed by the Collective but was eventually revived during the Chaos War. Toy form of all the Alpha Flight members, with maybe the exception of Sasquatch, Guardian has had the most figures. Hasbro released a figure during the Dark Days of Marvel Legends and it was part of a Walmart Exclusive wave that has the first version as the BAF. It had a very short and under stock run, with very few actually able to find it. 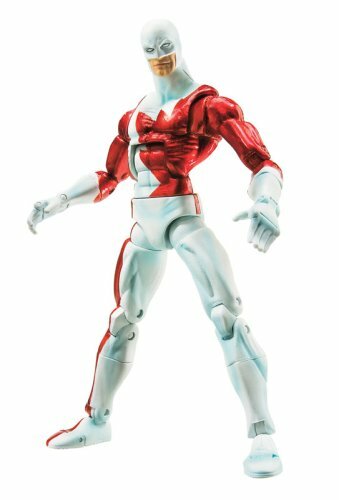 Hasbro then revealed an updated version in the Canadian Expo 2018 with it being revealed in Toy Fair 2019 that it is be part of the X-force Wave. When Mac redesign his suit, he streamline the suit to be much more form fitting. Not only that but he also designed it to represent the Canadian flag. Since then he has become Canada’s premier hero, similar to how Cap is America’s and Cap Brit is Britain’s. With the release of Sasquatch and counting the previous release of Puck (who could do with a re-release) we now have 3 members of Alpha Flight, a team that one of the members of Hasbro is a big fan of. But if you have no interest in that, then this is a must for any Wolverine fans, being one of his close allies. X-men fans might want this as well or if you want to build a patriot collection.